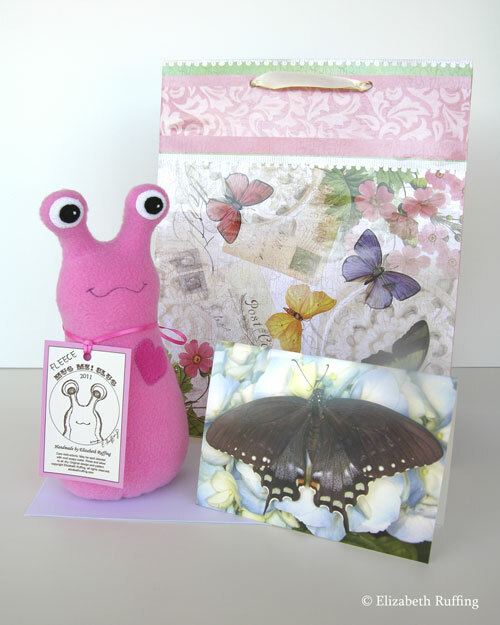 I had a rush order for a gift-wrapped baby shower slug last week. I think the whole package came together nicely. I’m thinking this is something I should have as an option for the smaller toys that will fit in gift bags, like the 9 inch Hug Me Slugs, and the Hug Me Toads. I may have some 7 inch slugs, from time to time, that would fit too. I needed a larger mailing box, and some extra postage, but it’s a good option for people who want to send a gift they can’t deliver in person. This cheerful custom turquoise-blue guy went out on Monday. I kept debating over whether I should make him in the turquoise that was in the one photo in his listing, or the turquoise-blue that was in the other photo in his listing. I realize I’ve gotten so many colors that even I am not sure which is which. They are very much alike. I think, ultimately, I will sew up the miscellaneous colors I have into ready-made slugs, and list a smaller number of more easily distinguishable colors for custom slugs. I can leave the larger variety as heart-color options. 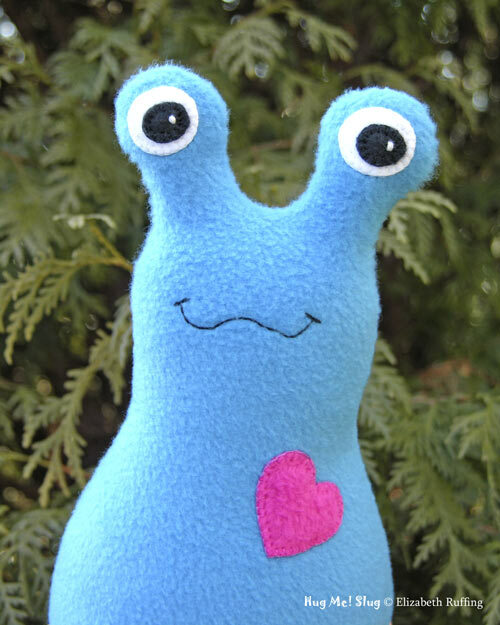 I received such a nice feedback this week on another turquoise Hug Me Slug named Sullivan, “We love Sullivan! Thanks so much for making him. My son lit up when we took him out of the package and has been bringing him with him while he tries to walk. Thanks.” I really enjoy these kinds of details, and I love the idea of a Hug Me Slug giving a boy moral support as he learns to walk. That’s so sweet. I’d love to see more photos of people with their toys too. That is great fun for me. 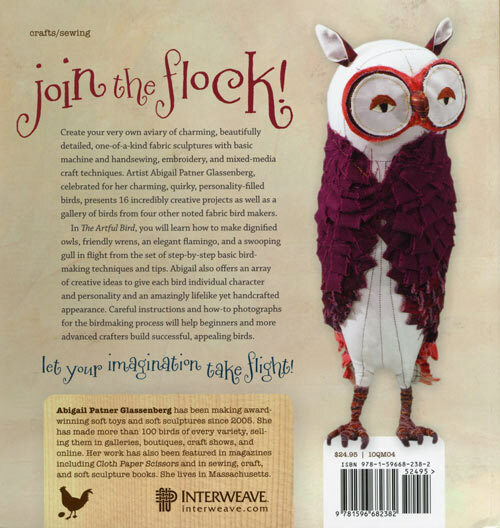 I just recently ordered some new sewing and craft books that I really like, and wanted to share them. 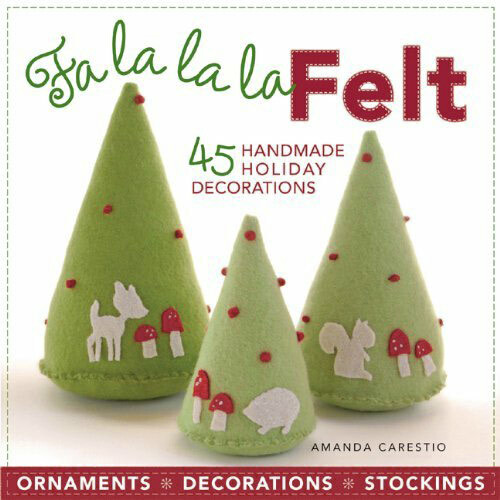 Fa La La La Felt: 45 Handmade Holiday Decorations by Amanda Carestio is on sale on Amazon.com. 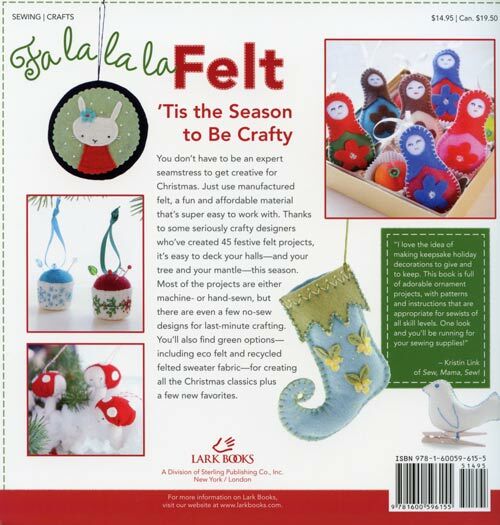 It’s a compilation of hand-sewn crafts by thirteen different designers, and there are lots of cute and charming ornaments, holiday decorations, and stockings inside. I was drawn in by the circular ornaments, like the one on the back cover below, with little animals on them, and the trees on the front cover, above. I want to try the ornaments out with my slugs and other characters, I think, and experiment with using fleece instead of felt. I remember having seen a photo of those trees in my blog browsing, years ago now, and was inspired to design my own crazy-looking Christmas-tree creatures. Mine was more like a hybrid with one of my slugs. Lots of inspiration inside this book. 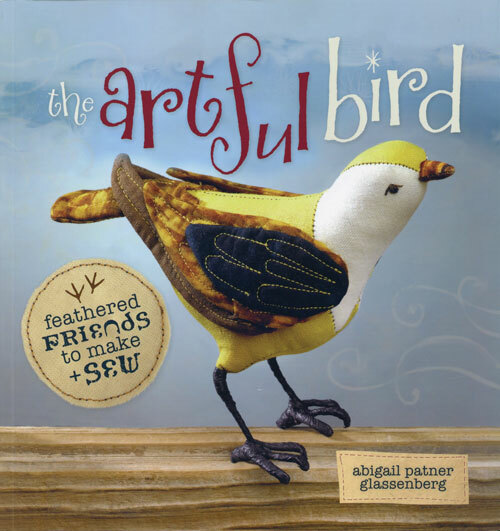 I also ordered The Artful Bird: Feathered Friends to Make and Sew by Abigail Patner Glassenberg, whose blog, While She Naps, I enjoy as well. This book is a wealth of information on designing and sewing all manner of birds. After seeing all the wonderfully creative birds in here, I will have to experiment some more with my own bird patterns. 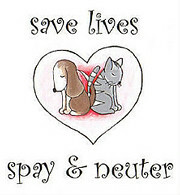 The love birds I made before were put on hold when my sewing machine that did the lettering for my hearts konked out. My Kenmore does lettering though, and I might give that another go. 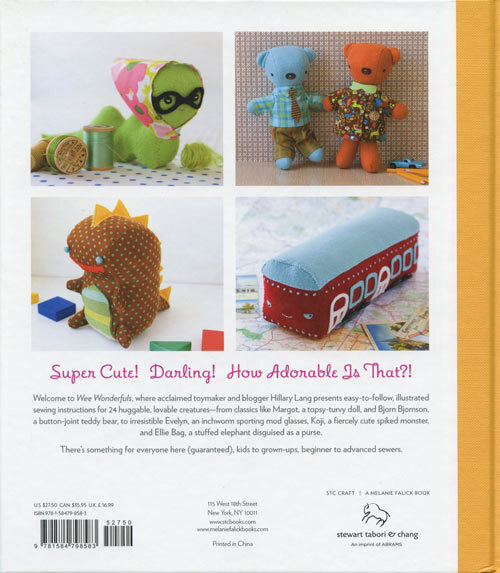 I’d like to tweak my pattern some more, and I think this book will give me lots of help. I actually went in to Sears this weekend, debating over getting a spare machine, because the model I have was, and still is, on sale again. I believe I ended up “selling” one to another lady who was also looking at them. It’s a good machine, in spite of my wishing it had adjustable presser foot pressure, but a walking foot can compensate for that in most cases. I think I “sold” that lady one of those too in a set of presser feet. I couldn’t make a decision between getting that model and another, and so I waited. 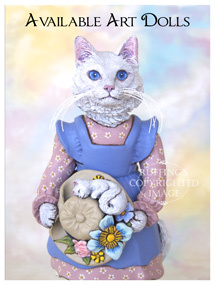 I might even go look at some more Janome‘s someday. They make that Kenmore. 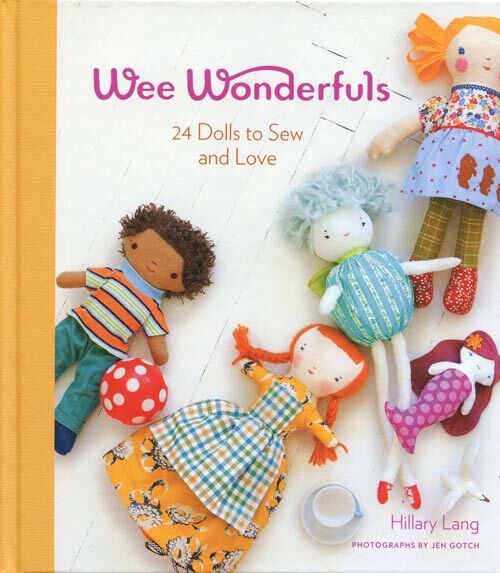 The third book I ordered is Wee Wonderfuls: 24 Dolls to Sew and Love by Hillary Lang. 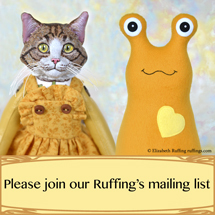 Hillary Lang is the author of another blog, Wee Wonderfuls, I have fun visiting. Her projects are also adorable. Not surprisingly, I think my favorite in this book is Katie Kitty. She looks like these kitties on Flickr. In fact, anyone who loves toys will enjoy checking out Hillary Lang’s “toys and dolls” set on Flickr too. They aren’t all in this book, but there is certainly a happy selection from which to choose. 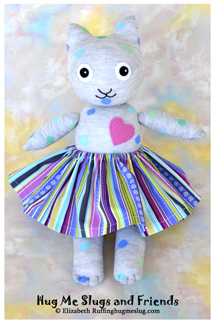 I loved her “Make-a-long Story” featuring her dolls you can make on her web site as well, and you can find more of her toy patterns available there. I’m happy with all three of these books. Sometimes sewing and craft books will have just one thing I’m excited about inside, but these were all put together with care and generosity. I think it’s so nice that these women all shared their creations and their knowledge. I was brave today and finally plugged in my Wacom tablet! And I registered my Corel Painter 11! I am set to learn all kinds of things now. In truth, I get scared of things that cost more than a certain amount of dollars, and it was hard to take the first step. Nothing has blown up so far, and knock on wood, all is going fine. I think I need a book for Corel Painter 11 though. I can’t find anything in there. I like to have a book on my desk, rather than try to toggle between online manuals and my work in progress. I feel more secure that way. Plus, I can go read away from the computer, which I prefer. I had Painter Essentials installed, with a trial version, and things aren’t in the same places. I will get the hang of it with trial and error, I’m sure.